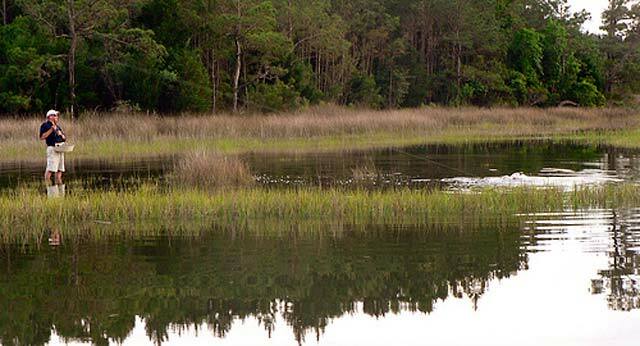 It’s high tide in the marshy creeks along the North Carolina Coast. Scei, the red drum (Sceianops ocellatus), is in the deep water of the channels that flow through the marshes. Here she can swim easily and look for shrimp, crabs and minnows. When the water gets high enough, she will leave the channels and go onto the flats where fiddler crabs live. These flats provide protection for the crabs at low tide and food in the form of the tiny things crabs feed upon. Scei could not access the flats just an hour or two earlier. There is no water there three hours before and after the top of the tide. Other forms of life join her on the flats. Finger-sized mullet, peanut menhaden. Blue crabs. Shrimp. Scei finds all of them. As the water floods the flat, Scei glides silently between the stalks of high grass along the creek channel. She is a four-year-old adult red drum, over 35 inches long and almost 20 pounds. Yet the grass stalks barely part when she swims by. To an observer, it might have been a breeze. She crosses onto the flat, immediately on alert. Shadows. Splashes. Unnatural sounds. She doesn’t have many enemies here: the water is too shallow for them. When she was younger though, she had a close call with an osprey that swooped down on her. Missed by just enough. She still bears a scar. Birds aren’t big enough to be a problem anymore, but she knows anything over her head is a potential enemy. An angler on the front deck of a skiff scans the grass flats. He and his friend like to fish for red drum with fly rods. Fishing in water this shallow and weed-choked is difficult. The cast needs to be dead on target and all the advantages are with the fish. That is why they do it. It’s the challenge. They release any fish they catch. As she moves along the flat, Scei instinctively moves into the shallowest water near the shoreline. This gives her the advantage. Her prey has a difficult time escaping because there is simply no place to go. Scei spots a fiddler crab straying too far from its hole. The crab is in the open, feeding. She effortlessly quickens her pace. The fiddler tries to disappear. Scei tilts her head down, flares her gills and opens her mouth. This creates a powerful vacuum that whisks the crab into her mouth. It is immediately thrown into the crusher plates at the back of her throat and quickly smashed into easily digestible bits. It can’t even begin to mount a defense. When the redfish eats the fiddler crab, she is only in five inches of water. Her tail stands straight up in the air. It splashes on the surface. Both anglers hear it. The angler in the front of the skiff grabs his fly rod and descends gingerly. Any excess noise will spook her. Carefully. Quietly. He wades to where the redfish feeds on the grassy shoreline. Scei continues to cruise down the bank. There is another crab out in the open. With a short burst from her tail, she easily nails it. 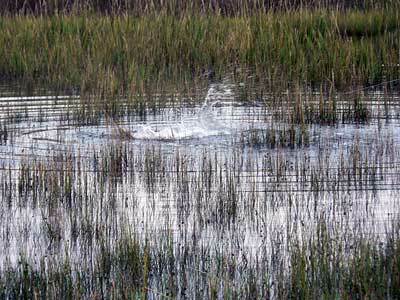 The angler spies the splash as the redfish accelerates. The same movement the fish makes to feed shows the angler where she is. He continues to stalk. Scei feels good now. Confident. She moves up the grass to even shallower water. Four inches deep. Many crabs have their holes here, easy meals. She glides along. Her flank skims dry ground, dorsal fin flat on her back. She is almost invisible from the surface, except for a tiny hump. The angler eyes her back and the tip of her tail fin. He is in position now and prepares to cast. His fly is a perfect imitation of a small crab. He needs to get it directly in her path and have it make a soft landing. It’s a 60-foot cast with no room for error. Don’t let her see the flyline in the air. Don’t slap the surface. Don’t drag the line across her back. Lots of don’ts. There is a small splash up ahead. Scei moves over to investigate. A small crab just under the surface. Barely moving. Struggling in the grass. A very easy mark. She moves in. Flares her gills. Opens her mouth. It’s gone. The angler reacts too quickly and lifts too hard with his rod. He pulls the fly out of her mouth before she can get it inside her crushers. Scei senses something wrong. Her prey jumped right out of her mouth and tugged her sideways. She notices something sticking way up out of the water. It reminds her of the egrets and herons she saw nab so many of her brood mates as a fingerling. She is reminded that anything overhead is a potential enemy. Powerful sweeps of her tail get her off the flat. The anglers watch the redfish speed away. She leaves a large wake. A torpedo moving through the water. There is nothing to be done now. In the safety of the deep water in the creek channel, Scei slows down. The danger passed. That crab was unfamiliar and its image will be retained. She won’t use that flat anymore. She is almost too big to be in such shallow water anyway. When the weather cools, she will move out of the creeks and into the open ocean to join hundreds of other fish of her age. There will be more danger. Sharks. Other anglers. She will continue to grow until she is very big–potentially over 50 or 60 pounds–and live 30 years or more. Her greatest purpose will be to produce offspring. Her body will manufacture more than three million eggs when she spawns. The anglers stalk the flats until the tide reaches its peak. They catch two red drum. Neither approaches the size of the first one. Still, a good day of fishing. Neither angler will forget the sight of that huge fish in water that shallow. The motor of the skiff starts on the first try and the sound of the outboard shatters the silence. A flock of ibis spook and flush at the sound. After a few minutes stillness returns to the marsh. Other crabs crawl through the mud to feed. 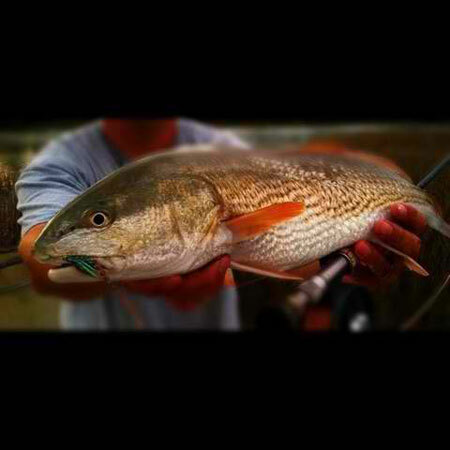 Other red drum swim in the creek channels.